My brother and his wife have been going through a long and painful process. From the work they did to get ready to be parents. To trying to have kids and discovering it will never happen naturally. To getting ready to adopt children. To being approved by the adoption agency. I am very excited for them to be parents. They'll make great ones. Jeff wasn't willing to have children until he had done a lot of work on himself. I think that's awesome. AND. I totally want to be an aunt. Their kid is going to be raised right by his/her parents, and it will be spoiled rotten by it's aunts, uncles, and grandparents. There's not much I can do to help them, but I can spread some (tiny) bit of awareness by posting on Facebook and on my blog. Here is the links to their profile and their blog. There's also a "Who's Your Daddy" Darth Vador shirt that's pink... just in case you have a little girl. 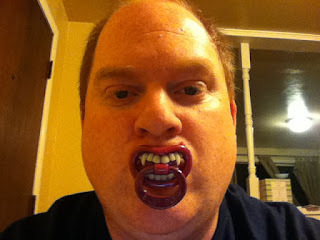 Mom actually gave me a vampire pacified a few years back. Here is a pic. She has been grandbaby hungry for a long time. I'm not sure if Robyn will actually let the baby use it. But adding a zombie one to the collection can't hurt. He likes me even more than fishing! No More Strangers: Check me out! I am wearing purple today.